Eat the flowers -purple with little yellow sprig (leaves aren't too great) Root tea used for kidney, female and stomach issues. Apply smashed leaves to stings and bites. 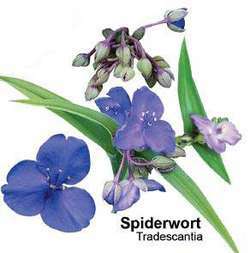 (spiderwort), a genus of perennial herbs of the family Commelinaceae. The stems are erect or spreading, and the leaves are alternate and oval or lanceolate in shape. The flowers, which are solitary or in inflorescences, have three free sepals and petals. The fruit is a capsule. There are about 60 species, distributed in tropical and subtropical America. Many species are raised as ornamentals. The common spiderwort (T. virginiana), an erect plant with linear-lanceolate leaves and large blue or violet flowers, has been cultivated in open ground since the early 17th century. Some tropical species, including T. albiflora and T. fluminensis, as well as their varieties with white stripes on the leaves, are raised indoors as basket plants. The plant Zebrina pendula, whose leaves are silver-banded above and reddish violet below, is often classified in the genus Tradescantia.